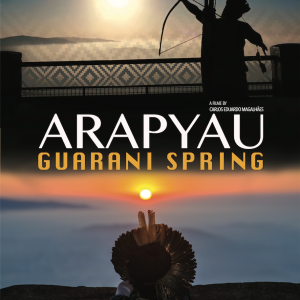 The Guarani Spring blossoms in our eyes like a new time. Reconciliation time to human ancestry. The smallest indigenous reserve in Brazil suffers from its proximity to the Juruá (non- indigenous). A village within the city of São Paulo. 800 Guaranis, live or survive, with their culture, their language and traditions, the contradictions of the urban, peripheral world. Once their lands are demarcated in 2016, in 2017, for the first time in the history of Brazil, a land clearing process takes place. (Guarani’s God) they begin to organize to fight for their rights. They organize a protest on Avenida Paulista with more than 2,000 indigenous people from various states. And for 24 hours they occupy the lobby of the office building of the president of the republic, chanting uninterrupted chants. A espiritual rituasl on Paulista Avenue. But the Guarani spring is only beginning, in an act of resistance and audacity, occupy for 3 days the transmission towers of the Jaraguá Peak. Claiming the presence of the state governor. Tension and climate of war, and in this clash of forces, the warriors, turn off the transmission of Rede Globo and the Company of urban trains. The media and power finally wave to the Guarani. Opening dialogue and commitment to keep promises made to our heroes. From within the indigenous movement, we know this people, inhabiting a metropolis, unknown to the great majority of the population, their struggle for land comes to the survival of what remains of nature in the city, a struggle of the sacred against the misery of the Juruá, (not indigenous) with life on earth. Thus being a struggle of all human beings.